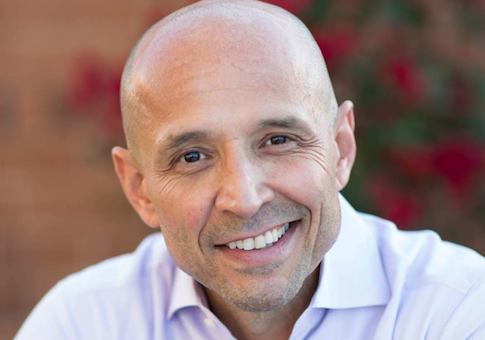 A longtime Democratic operative in Arizona says he is disappointed that David Garcia, the frontrunner in his party's gubernatorial primary, has embraced a strategy of using his race to court Latino voters in the state. Mario E. Diaz, who led Democrat Janet Napolitano's successful campaign to be Arizona's governor in 2002 and remains a prominent political strategist in the state, says he's not aligned with any candidate for governor, but thinks Garcia's aim of using his last name to win over Latino voters is both "insulting" and a "losing strategy." He says the strategy has been overtly clear. "This is not a dog whistle, this has been a dog howl," Diaz said. "They are making the Latino community feel compelled to vote for somebody with the last name Garcia, which to me is an insult to the Latino voter." Democrats have long fantasized about the idea of harnessing the rapidly growing minority populations to flip the balance of power in traditionally red states like Arizona, characterizing it as a "demographic revolution." Liberal financier Steve Phillips responded to the party's 2016 loss by founding Democracy in Color, "a political organization focused on race, politics and the multiracial, progressive New American Majority." The strategy is outlined in his book, Brown Is the New White, which argues the Democratic Party's future relies on harnessing "progressive people of color." Phillips wrote in The Nation earlier this summer that Garcia's bid in Arizona offers a roadmap for his national plan, but his reasoning never goes beyond Garcia's identity. "With Garcia, a Mexican-American who comes from and resonates with the Latino community, at the head of the ticket, the potential to bring more Latinos to the polls is immense," he wrote. He argued promoting Garcia should be prioritized above promoting white Arizona Democrat Kyrsten Sinema, solely because he's Mexican-American. "The way to win seats in Arizona—for the Senate, House and other races—is to inspire core Democrats, Latinos in particular," he wrote. "And the way to do that is by lifting up David Garcia’s campaign and unleashing a brown wave of voters that will lift all boats and turn that formerly red state blue." Garcia has embraced this mindset, appearing on Phillips's Democracy in Color podcast and saying, "I believe a Garcia needs to win in Arizona." "For this state to really reach its promise, for this state to be fully represented by the people of Arizona, somebody with my last name needs to win," Garcia said. Diaz says it's "insulting" that Garcia holds this view of Latino voters, who have the same priorities as everyone else in the state. "The Latino voter, just like any other voter, wants to know what you're doing to move the state forward," Diaz said. "It diminishes the value and the intelligence of the voter, in terms of voting for somebody because of qualifications as opposed to one's ethnicity." "I don't see anything wrong with announcing your background when you're speaking to the community," he explained, "but as a strategy to win Arizona's governor's race, not only is it insulting to Latinos, it really is a losing strategy in a state where independence is valued at a higher level than any other characteristic." Garcia disagrees, telling the Arizona Republic he is better able to court Latino voters in a general election than his two opponents, who are both white. The gubernatorial primary takes place on August 28. "We need to change the electorate," he said. "I believe my campaign, and me as a person, are best suited to making sure we increase voter turnout." "I believe we’re going to hear the true voice of Arizona," he said. Phillips views politics through a racial lens, arguing that the foundation of President Donald Trump's 2016 win was "hostility to Latinos." He believes Garcia winning a race-focused election in Arizona will send a message that could catapult the country closer to the one he envisions. "Electing David Garcia—a person who comes from the very community Trump demonizes and who is unapologetically committed to building an inclusive, multiracial democracy—will represent a resounding rejection of the nativist, nationalist, and racist impulses lifted up by this president," he wrote. Phillips is similarly attempting to harness the power of Stacey Abrams, a black gubernatorial candidate in Georgia. He wrote in June that the country was six months from "having a Governor Abrams in Georgia and a Governor Garcia in Arizona serving as the cornerstone of a new multiracial progressive political order in America." Abrams headlined an event attended by major liberal donors earlier this year where reparations were discussed as a possible Democratic policy proposal in the future, the Washington Free Beacon reported. Diaz said he is a "true Democrat" but thinks his party wins by presenting qualifications. "I am a true Democrat, I have been and always will be a Democrat," he said. "But as I've become older and more mature, what I want to see from a candidate is qualifications." "In between when Garcia ran for superintendent of public instruction in 2014 and now, what has he done to put a plan together for the voter? I have a difficult time understanding what his vision is for Arizona." This entry was posted in Politics and tagged 2018 Election. Bookmark the permalink.